The 31st Annual Iroquois Indian Festival takes place on Saturday, Sept. 1 and Sunday, Sept 2, at the Iroquois Indian Museum, 324 Caverns Road. For two days, from 10 a.m. to 6 p.m., the Festival features traditional Iroquois music, dance, Native foods and much more. Admission is $10 for adults and $5 for children. This year, Dr. Darryl Tonemah, an award-winning singer/songwriter, will be the featured performer on both days. Tonemah, Kiowa/Comanche/Tuscarora, is a doctor by day and a musician every chance he gets. His music combines the energy of rock, the intelligence of folk, and the heart of country &#8212- creating a musical niche he calls, “Native Americana”. His work, Welcome to Your Rainy Day, won the best Folk Recording in 2007 from the Native American Music Awards. · The Sky Dancers of Six Nations. The Sky Dancers are from the Six Nations Reserve in Southern Ontario, along the Grand River. Many of the dancers are members of the Cayuga Nation. The troupe will present traditional Iroquois social dances, the increasingly popular &#8220smoke dance,&#8221 and will be inviting audience members to join them on the dance floor. 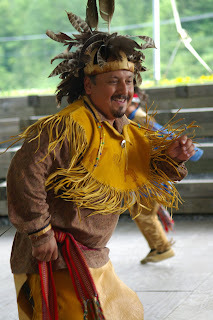 · Iroquois Social Dances. Social Dances are different from ceremonial or sacred dances. Socials are group dances performed on various occasions, and are meant for everyone. These are the dance traditions of this land, with ties that connect to a dynamic heritage going back more than 10,000 years. Such dances are always performed to music. The musicians create the melodies and rhythms with voice and traditional Iroquois instruments. The dancers perform in stunning hand-made traditional clothing. · All-Iroquois Native Art Market. Meet with the Iroquois artists and learn firsthand about their creations. The Market features both contemporary and traditional works. Your purchase of Iroquois art directly supports the efforts of Iroquois artists. · Archeology and Flint Knapping Station. The Archeology Table will be set up on the on the main floor of the Museum, and staffed by volunteers and members of the Museum’s archeology department. They will help visitors to identify objects they have collected. A flint-knapping demonstration area will be located on the rear deck. Flint knapping is a skill in which a raw piece of flint is chipped to form an arrow point. · Wildlife Rehabilitation. Local wildlife rehabilitator Kelly Martin cares for injured and orphaned birds of prey and other creatures that are unable to return to the wild. Wildlife rehabilitators are volunteers licensed by the Department of Environmental Conservation. Ms. Martin will display a variety of birds and animals and is available to answer questions and share her experiences. · Self-Guided Nature Park Tours. Take a self-guided tour through the Museum’s 45-acre Nature Park. Using our informative trail maps and plant signs, learn about native plants and trees and how Iroquois peoples have made use of them for food, utility, and medicine. Currently on display at the Museum is the exhibition, &#8220Birds and Beasts in Beads: 150 Years of Iroquois Beadwork.&#8221 The exhibit features more than 200 beaded objects, largely from the collection of retired archeologist and Museum trustee, Dolores Elliott. The Museum is open from 10 a.m. to 5 p.m. Tuesday through Saturday and from 12 Noon to 5 p.m. on Sunday. It is closed Monday. Regular admission is $8 for adults, $6.50 for seniors/students and $5 for children ages 5-12. Children under five are free when accompanied by an adult. Special group rates are available by calling the Museum at 518-296-8949. For more information: contact the Iroquois Indian Museum at (518) 296-8949, info@iroquoismuseum.org or visitwww.iroquoismuseum.org. what is the town it is located in (or near to)?